Create your own unique fine silver jewelry! 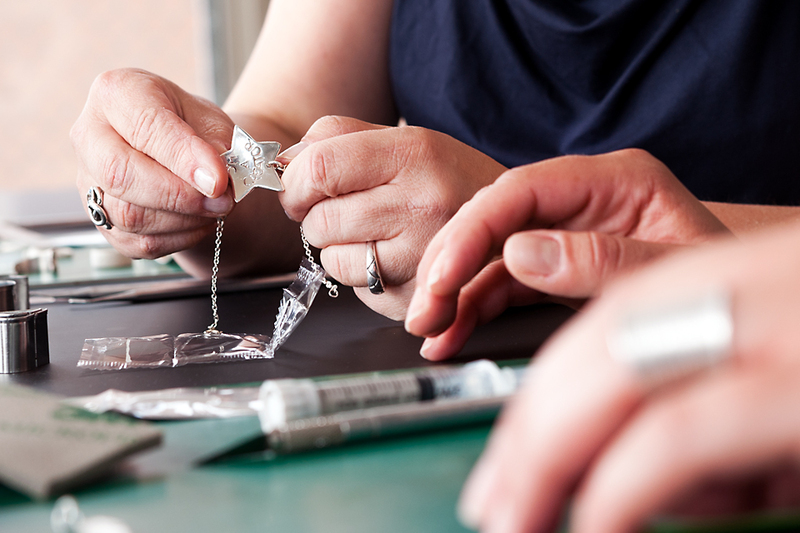 Learn the basics of ArtClay Silver and create your own finesilver pendant - for yourself or as a precious present. In just 4 hours you'll experience the beauty and simplicity of this amazing material and take home your finished piece of jewelry. In the course you will choose from 3 simple pendant options and learn to mold, sand, fire and polish your design. The workshop costs 199€ incl . VAT plus material and 10 gram of silver. Additional silver and material will be calculated onsite depending on what you've used (10gramms = 22,20€), 1 circon 2€ etc.. Participation is only possible with pre-registration and payment. There is no previous experience required. Snacks are included as well. The course takes place with at least 2 people. Dates upon request. 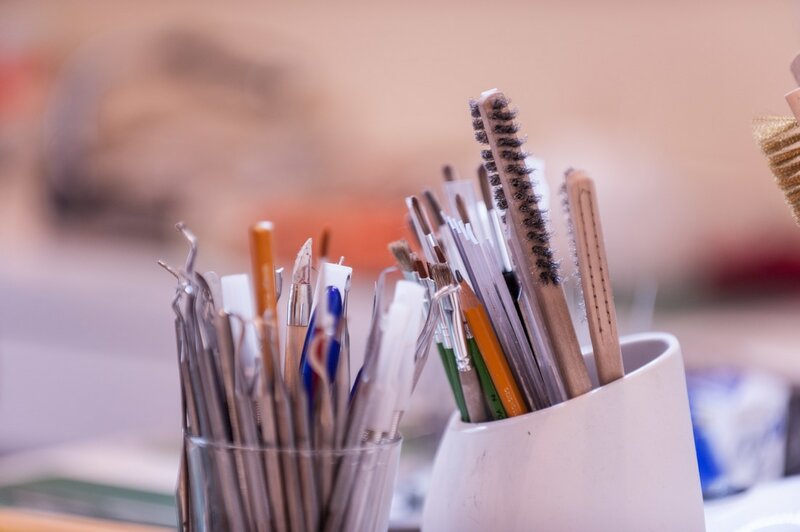 Learn to use and design with ArtClay Silver and create your own finesilver pendant, earrings or even a ring - for yourself or as a precious present. Setting stones, adding bails etc and use different clay techniques is all open to you. Over the course of 6-8 hours you'll experience the beauty and simplicity of this amazing material, implement your own ideas and take your finished piece of jewelry. The time depends on the complexity of your piece. The worskshop costs 279 incl. VAT and 10 grams of fine silver. Additional material will be charged according to use. Workshop dates can be made upon request. Workshops will be held starting with 2 participants. 21.07.2018 from 10am to 4 or 6 p.m.
04.08.2018 from 10am to 4 or 6 p.m. Dates for English workshops upon request. Yes, I'm interested in a jewelry workshop! Maybe we go for a star-bracelet? Working with silver clay is a magical way to spark one's own creativity, play with endless possibilities and realize unfulfilled (jewelry) wishes and ideas. You know how to knead, right?! When you remember how to work with dough, "play-doh", "fimo" or any other moldable material from your childhood or even baking cookies, you know that you can create almost any form you want, right?! It's as simple as that. If you think clay and pure silver at the same time, you're already half way there. It starts with understanding the seemingly grey material, continues with some simple steps using a few tools most of which you find in your household and craftstore and it ends with a unique piece of jewelry of pure silver in your hands. It might become the most precious present, your own perfect piece or even a symbol of your life. There will be no other like yours, because you are the designer and creator at the same time. For me, silver clay is like a magic material to create fine jewelry with. (Yes, one of my life's loves). And I absolutely love to share and teach it's magic. Either 1:1 or in group workshops. That's why I created the MetalClay Academy. For offline and online courses. As a resource for inspiration, knowledge and material. No matter what kind of course you take, whether you come with a defined idea or with uncertainty of what you want to create, at the end of you'll hold your own beautiful handcrafted design in your hands. Made from your ideas with pure silver. And I will be with you on each step on the way, from your first design drafts to the final touches on your own fine silver art design. I'll share my knowledge with you, the experience I've built over the years and everything that matters for your unique jewelry design. Do you feel a slight tingle in your fingers? Wouldn't it be fun to create your own jewelry from pure silver? Would you like to know how to get started? I'm looking forward to helping you create your own unique piece of fine silver jewelry! Let's create something extraordinary together!